Packed with flavor and the right amount of heat, we crafted our Premio Hot Italian sausage with spice lovers in mind. This sausage is an excellent way to infuse taste into kabobs, bring life to a pasta dish and add zing to a sandwich you won’t want to share. Pick some up today. This is Premio’s signature Italian sausage bursting with flavor and some heat. 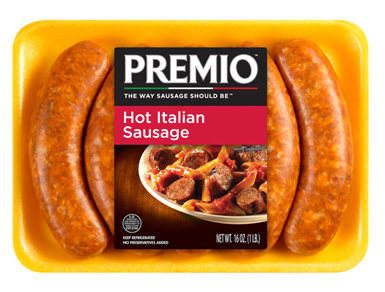 Satisfy the spice lovers in your family with Premio Fresh Hot Italian Sausage! Including our hot sausage in your recipes will definitely excite taste buds! Add some spice to a pasta dish, stuffed peppers or grilled kabobs by including Premio Hot Italian Sausage. Search our recipe section to find more ways to add some kick to your next meal. What Goes Into a Hot Real Italian Sausage? So what makes a hot Italian sausage, and how is it different from a sweet or mild Italian sausage? While all real Italian sausage is usually made from pork shoulder, ground, combined with spices and then typically put in hog casings to make links or shaped into patties, hot flavored Italian sausage has that added kick and that extra spice that lets us know we’re enjoying a hot Italian sausage. That extra spice is red pepper flakes, and Premio hot Italian sausage links have just the right balance to give our Premio Hot Italian Sausages a robust, flavorful taste without being overwhelming. There’s a place for mild sausage and a place for sweet sausage, but a good hot Italian sausage can get even the most selective food connoisseur’s mouth watering! Hot Italian sausage has such an amazing and flavorful taste that it can give new life to virtually any dish. A perfect example is meatloaf. Even if you love meatloaf, after a while it can get pretty boring — and you can bet your kids are getting sick of it, no matter how great a cook you are. Add a little Premio Hot Italian Sausage to the mix, however, and everything changes. Don’t believe us? Try this recipe for classic meatloaf that incorporates our Premio hot flavored Italian sausage and see if the whole family doesn’t come clamoring for more. Tell your family it’s meatloaf for dinner tonight and check out the bored look on their faces. Then, watch their eyes light up as they bite into this bursting-with-flavor treat. Start with a pound of Premio Hot Italian Sausage. You’ll also need two large, lightly beaten eggs, two tablespoons of unsalted butter, a cup of chopped onion, a chopped celery rib, a chopped carrot, a half-cup of finely chopped green onions (greens included), three cloves of minced garlic, a third-cup fresh parsley leaves, one and a half teaspoons of salt and a half-teaspoon of fresh ground black pepper. You’ll also need a pound and a half of ground beef, two-thirds of a cup of ketchup, two teaspoons of Worcestershire sauce and a cup of fresh bread crumbs. If you’ve ever made meatloaf before, preparing this will be a breeze. Just preheat the oven to 350 degrees with a middle rack. Melt the butter in your skillet on medium heat. When it starts to foam, sauté the onions, carrot, celery, green onions and garlic for five minutes. Cover the pan for another five minutes, stirring occasionally. Sprinkle in the salt and pepper and throw in the Worcestershire sauce and half your ketchup. After another minute, remove from heat. Once cooled, combine the mixture with your beef, chopped up hot Italian sausage, eggs, breadcrumbs and parsley. Mix it all together until it’s even throughout. Put the mixture into a 4” x 8” or 5” x 9” loaf pan and shape it into a compact loaf. Cover it with the other half of the ketchup. Bake for an hour at 350 degrees, remove, give it ten minutes to cool and serve your family a meatloaf like they’ve never tasted before. Use our store locator to find where our Italian sausage is sold near you!